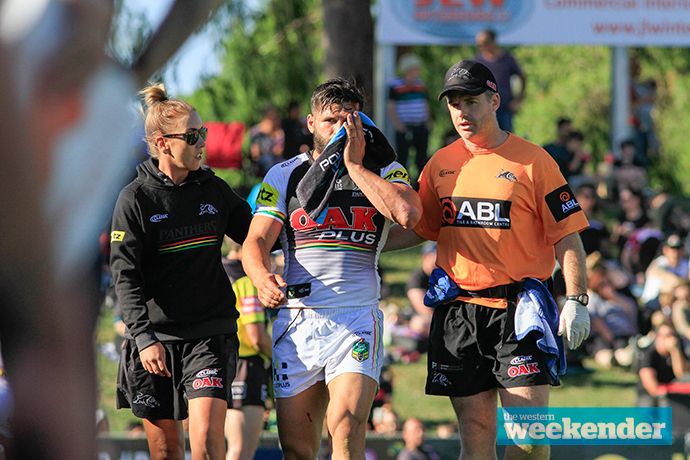 Powerhouse winger Josh Mansour was off to hospital before last Sunday’s game against the Titans was even over. His fractured cheekbone, suffered after a stray knee from Anthony Don collided with his face during a challenge for the ball, will keep him out for at least the next month, and adds to Penrith’s injury woes. We checked in with the Panthers on Tuesday who confirmed Mansour still hadn’t undergone surgery and needed the swelling to go down significantly before doctors could work their magic. The Panthers have been linked to St George-Illawarra forward Leeson Ah Mau. The Samoan international is off-contract at the end of the season and is rumoured to have attracted interest from both the Panthers and Knights, as well as his current club. It’s been revealed for the first time that Bryce Cartwright has a clause in his contract with the Gold Coast Titans that allows Penrith the first opportunity to re-sign him should all not work out on the glitter strip. Halfback Jarome Luai is off-contract with Penrith at the end of the season and it’s looking increasingly unlikely that he’ll stay at the foot of the Mountains. He’s now 21 and itching to play first grade, but NRL coach Anthony Griffin has resisted the temptation to blood the youngster despite two separate opportunities to do so in the wake of injuries to Nathan Cleary and Waqa Blake. Spotted: Reagan Campbell-Gillard and Trent Merrin doing some grocery shopping together last Saturday morning. Spotted: Nathan Cleary talking to former Panthers lower grades coach Garth Brennan in the tunnel at Panthers Stadium last Sunday. The two were having a yarn during the ISP clash between Penrith and Canterbury. Nathan Cleary could have another 15 years in first grade ahead of him but he’s already trying out new career options. He spent some time in the Fox League commentary box during the second half of Penrith’s clash with the Titans last Sunday, alongside Andrew Voss and Michael Ennis. While on air, Cleary revealed his recovery from a knee injury was ahead of schedule and he’s hopeful of an early return against Newcastle in round 10. Plenty of Penrith supporters aren’t fans of Phil ‘Buzz’ Rothfield from the Daily Telegraph, but many are too gullible and play into the supposed war between Buzz and Panthers boss Phil Gould. Last weekend, Rothfield revealed that he and Gould text each other weekly and have a good relationship these days. Buzz declared Gus was “the voice of the game”. Imagine this: You’re at the urinal after full-time on Sunday singing ‘Go The Mighty Panthers’ when a voice joins you from a nearby cubicle. After the duet, the cubicle door opens and it’s none other than club legend Royce Simmons who’s been testing out his singing voice. Spotted: Trent Merrin dancing up a storm alongside Vintage FM host Wayne ‘Willmo’ Willmington last Thursday. Penrith forward Isaah Yeo’s family has a proud history in rugby league and they continue to give back, especially in Dubbo where much of the family is based. Isaah’s grandfather Pat is a member of the local Men of League branch, and undertakes a number of welfare visits in the region to those in the league community who have fallen on tough times. 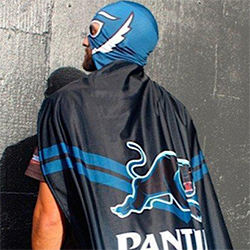 Spotted a Panther out and about or have a bit of news / gossip? I treat all info with absolute confidentiality! Email me at maskedpanther@westernweekender.com.au.